Yes, doggie fitness! What pets will benefit? Shy dogs, small dogs, large dogs, reactive dogs, social butterflies, senior dogs, puppies ---- in other words, all pets. Do something different with your pet, have fun and work their mind and muscles! 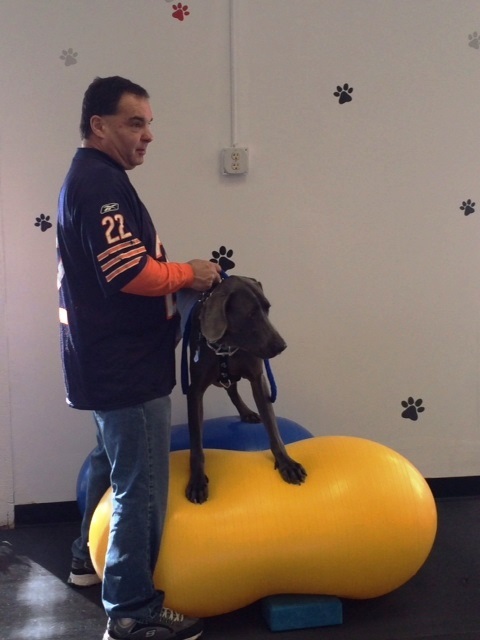 New Canine Fitness classes work on your pet's mobility, agility, confidence and muscle tone. Your pet will work on foot placement, balance discs and wobble boards. All of these things help to build a dogs core muscles and large muscle groups which may help prevent certain medical ailments, assist in mobility as your pet ages. It is also a lot of FUN! Your pet will also learn impulse control and improve their obedience skills as they will all be used during our fitness time. These types of activities also promote confidence in your dog as well as burns off excess energy. FitPAWS fitness equipment and various other balance equipment will also be used. Cost $140.00 - six week session / $25 per session on a drop in basis.